Laptops are sensitive and high technology infused gadgets that need professional handling for repairs and servicing. 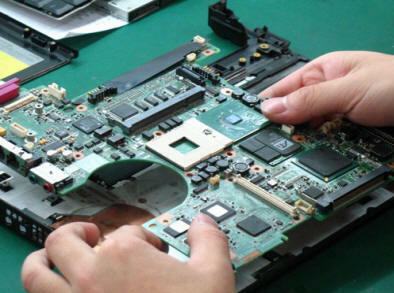 Motherboard is one of the critical elements of a laptop, which needs the hands of experts in case of repair. Ram Infotech is one the best laptop service centers in Chennai and offers high-quality motherboard chip level services. We have a dedicated team of 20 engineers with more than 6 years of experience, who can handle all kinds of sensitive repairs and services with expertise. We tackle problems to all the latest laptop models from hp, Compaq presario, dell, acer, Toshiba, sony, ibm and Lenovo with relative ease. Whether you are facing a problem with laptop restart, hung laptops, problems with the memory control, power supply, keyboard control, display issues, dead laptops, processor control issues, bios problems, audio related problems, battery section issues, problems with D C pin, VGA, USB, LAN, wireless sections, etc, our technical expertise is adept in diagnosing and rectifying the problem in the minimum time possible. We offer the fastest delivery times and the best laptop services in Chennai, so that you do not face problems at work. Affordable prices, quality chip level service and highly experienced technicians are the major factors that drive our flawless services in motherboard chip level service.